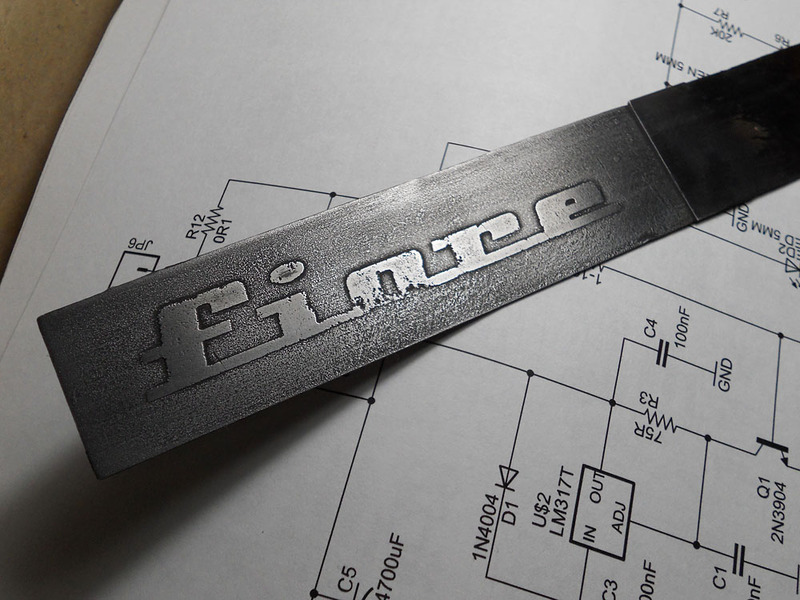 I’ve been working on a metal project lately and I wanted to have a name / brand plate riveted to the project, after finding out how expensive a custom one can be I decided to try etching my own using very few tools and chemicals. 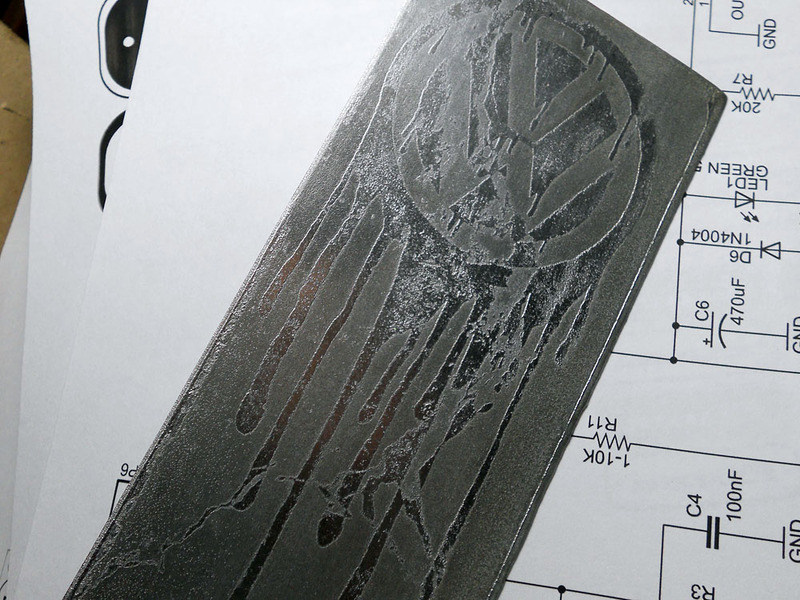 The process is similar to toner transfer PCB etching, however we’re going to be using sheet metal (mild steel) and we won’t be etching any traces, instead we’ll have our own logo, specs or any other information we want to add to our plate. We will also choose electrolysis over acids. Personally I’m a huge fan of the “cast iron” look you can get with this technique, pretty neat huh? 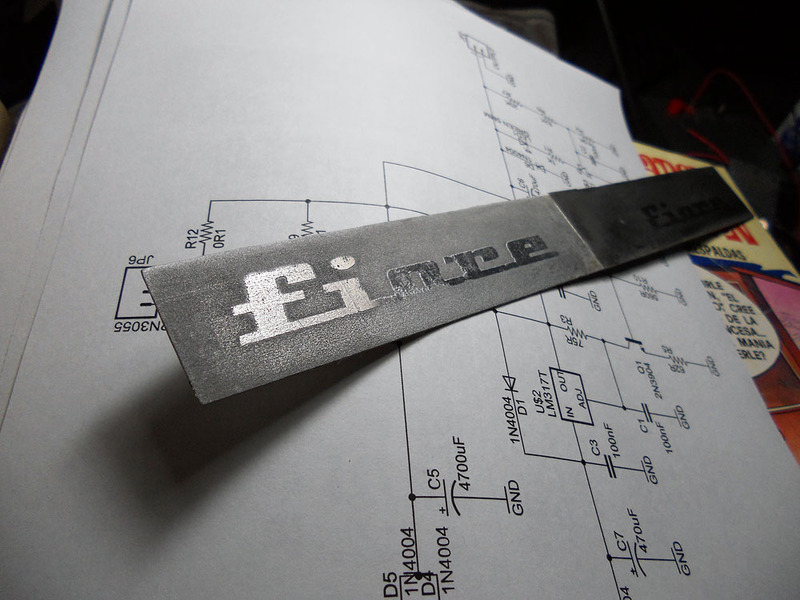 Design it, print it, etch it. Once you’ve got your black and white design ready, go ahead and print a mirror image to the desired dimensions. Trim your sheet metal to size, mine was 1mm thick but you can use whatever you’ve got. Decide whether you want to leave an edge or not. Clean the sheet metal, use a degreaser or common soap and a brush or pad to remove any oils and dirt it may have on it’s surface. Sorry, no pictures of this step. You could choose whether to score the surface using 220 grit sand paper (or coarser) or just let the original surface be, it’s up to you. Sorry, no pictures of this step. Proceed to toner-transfer as usual using your favorite method (a clothes iron works just fine). 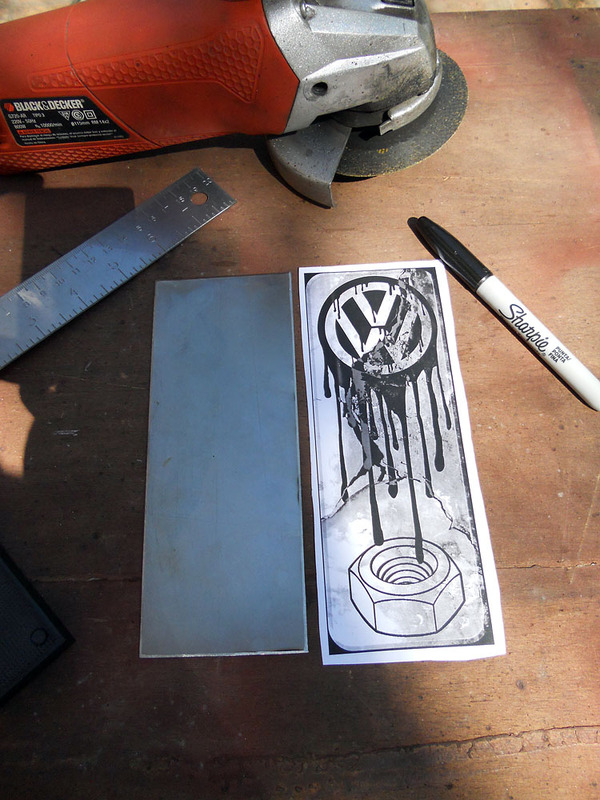 Toner applied, ready for etching! Prepare the electrolyte, washing soda and water is preferred but you can get away with salt and water; just do it outside and away from ferrous objects you may wish to remain intact (chlorine gas will rust them). The amount depends on how much water you’re going to use, per liter I use 4 spoons of either chemical, in essence the more conductive your electrolyte is, the more current is allowed to flow and thus the faster the etching process becomes. I’m not entirely sure if the surface finish becomes rough with the increased current, you’ll have to experiment for yourself! Use a battery charger or an ATX power supply, in fact any power supply capable of providing DC at several amps will do. 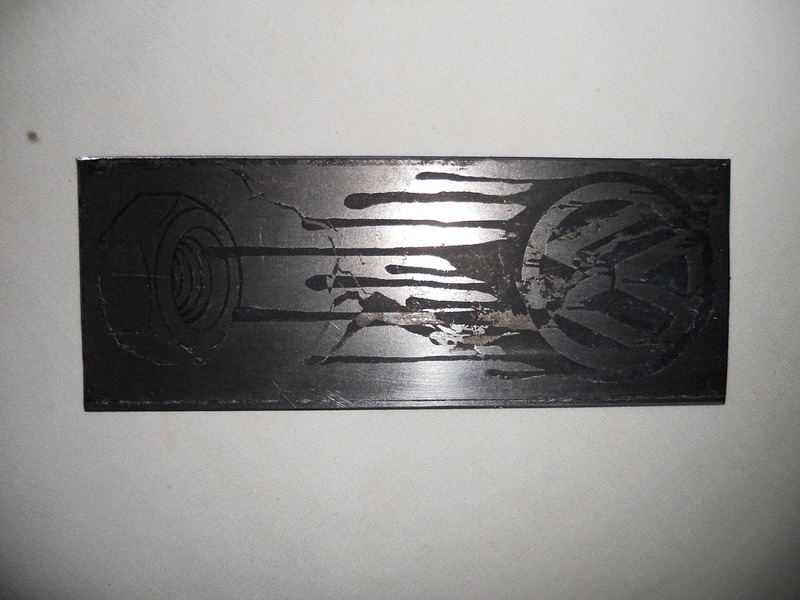 Your plate to be etched has to become the anode (positive) and the cathode (negative) terminal is connected to some scrap steel. This steel will actually become de-rusted, so maybe choose something you want to restore and kill two birds with one stone — Just try to match the surface area and keep the two parts evenly apart. Etching… If you think the colour of the electrolyte is nasty, give it a few more minutes… The cathode is indeed too small, but it’s what I had. Plus I wanted to de-rust that part. 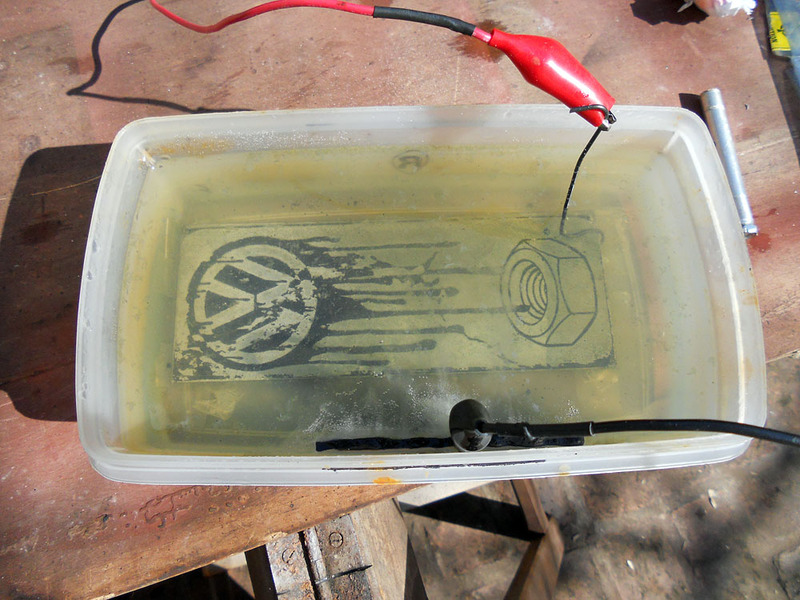 Notice the steel wire used to contact the anode with the plate to be etched, try not to use copper. I often leave the plate to etch for half an hour and I don’t care about the amps going through, I just remove it periodically and touch the surface to get a feeling of how much metal has been etched away. When to stop is up to you, just keep in mind the resist (the toner) won’t protect the metal from the sides, so you’ll get what’s known as undercutting after a certain point. There’s also the fact that if your current is high enough, the resist will begin to peel off. This could also happen if your part and electrolyte become overheated, so keep an eye on that matter. Finally etched, it didn’t come out as I expected but it was a good way to learn, after all this was my first attempt! This is the result after etching another design, no patina yet. So the contrast is low. There’s some undercut and portions where the resist peeled off; the current was too high. You can leave it as-is for a natural finish, you can sand it with emery cloth or you can apply a layer of black oxide (hot or cold, up to you) and either leave it as-is or brush it to increase the contrast of the letters and to make it look aged. To black-oxide the plate without chemicals you’ll have to heat it red hot, then quench on linseed oil or motoroil. For a higher degree of control over the process you can choose to use a rag soaked in oil instead and apply that to the hot plate, just be careful and do this outside, the fumes are noxious and there’s always the risk of a fire, so keep sand or an ABC extinguisher nearby. This method requires multiple passes and takes a lot longer, but you can get any colour you want from gold to blue. The end result, pretty good for the money! — All that remains now is a simple cut and a couple holes to be drilled, a countersink wouldn’t hurt either. If all went well, you’ll have a nice looking plate for your current project, or just some pretty cool piece of art. Don’t get stressed out if it didn’t come out exactly how you wanted it to, it’s still usable and unique.